He said the Government had invested well in making sure that municipal councils were adequately equipped to cope with the increasing volume of waste resulting from rapid urbanisation. Mr Bala said the widespread demand from peri-urban areas and informal settlements meant that proper waste management was essential. The Fijian municipals councils provide kitchen waste collection services to 28 villages in urban areas across Fiji. 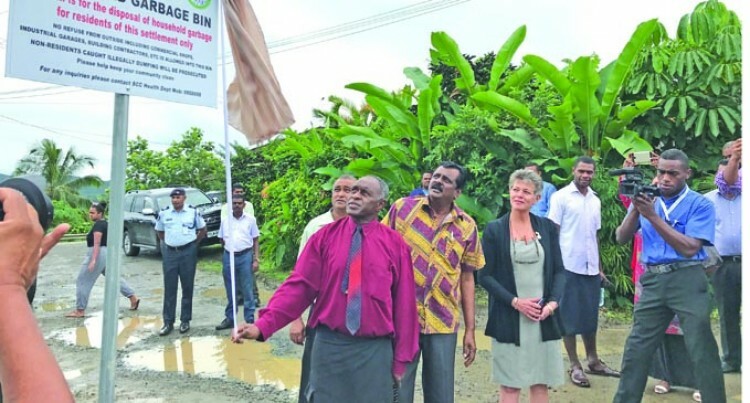 “Services have also been extended to informal settlements in within town and city boundaries with services provided to almost 80 such settlements across Fiji,” Mr Bala said. He said the Government was committed to address solid waste management challenges. He said to build capacity, Government had invested in six nine-tonne compactor trucks worth $1.4 million for Nasinu, Nausori, Lami, Ba and Nadi municipalities to assist in waste collection. “We are working closely with Japan Embassy, which has recently donated two nine-tonne compactor trucks. As well, the embassy has been providing Japan International Cooperation Agency (JICA) volunteers to municipal councils to assist in environment programs,’’ Mr Bala said. The initiative is dedicated to peri-urban areas in the Central Division, and the ceremony was held in Vunileba Settlement, in Tacirua, outside Suva on Tuesday. He said the municipal councils had a close and lasting relationship with local iTaukei villages both in their boundaries and in adjourning areas. “Apart from the Government and municipal solid waste management services, there needs to be individual responsibility in how each of manages waste,” Mr Bala said. The municipal councils today run more than 250 clean school programmes across Fiji including rural schools. After services are provided to an initial 10 settlements, the waste collection service will then be extended to cover 20 peri-urban settlements in the central division. Mr Bala said the municipal councils have been one of the agencies strengthened and relied upon to create awareness. “The waste is now properly disposed-off at the landfill in Naboro which otherwise would have ended up in our drains, creeks, rivers, roadsides and even in our own backyards creating multiple environmental and health hazards,” he said. “The benefits for the communities with regular collection services are general sanitation of the community is improved; litter and other toxic elements would no longer contaminate productive land, creeks and rivers; and more land would be made available for farming or extension of settlements. “People have to take responsibility and contribute towards waste management. It should not be left to municipal or Government authorities.